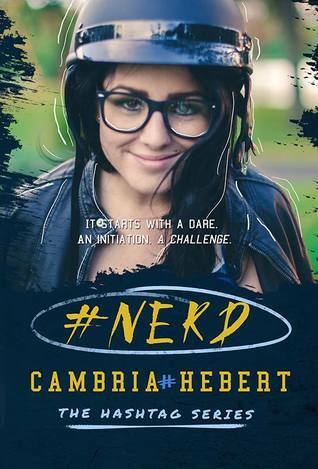 #Nerd is the first book in the new New Adult Hashtag series by Cambria Hebert. I was really looking forward to reading this new series by this great author, and it did not disappoint. Cambria, if you’re reading this: please tell me book #2 is on the way?! I need more of Rimmel and Romeo! Romeo was just like everyone else. My exterior would keep him at arm’s length, exactly as it should. So this book follows the story of Rimmel and Roman aka Romeo. Rimmel is a nerd. That really is the word to describe her, according to Romeo she is just missing the white tape in the center of her glasses. Anyway, Rimmel is on a scholarship, and to keep it she is told to tutor a student. And she soon discovers it isn’t just anyone she has to tutor. It is Roman, better known on campus as Romeo. The blue-eyed (yep, definitely a Cambria Hebert book 😉 ), football playing hottie with – according to Rimmel – the attention span of a slice of bread. He is the kind of person who doesn’t hesitate to take his shirt off to dry a water puddle. And not just to be helpful. Romeo isn’t really happy with the tutoring. But he has to, otherwise he won’t be allowed to play football, his passion. A few off the other things on Romeo’s mind are girls and Alpha Omega, a frat house. He want’s to get in because it is his shortcut into the NFL. And then he is rushed by Alpha Omega. And one of the assignments the pledged have, is to sleep with an assigned girl, and make a photo as proof. And then Romeo finds out Rimmel is his assignment… As he starts to get to know more about her, he realizes she is not as lame as he thought she would be. And Rimmel finds out there is more to Romeo than the muscles. Will Romeo risk it all? I was into her and it was creating some kind of war inside me. A war between the guy I was and the guy everyone wanted me to be. It never used to be a competition. I was happy to be that guy. The player, the football star, the charmer. I was those things. But I was more. I have to say there is not more to the story than I just wrote down. And I did guess Rimmel was going to be Romeo’s assignment. But I simply did not care. It is a very well written romance story that screams Cambria Hebert from page one. It has the humor, intelligent writing and slight changes in chronologically that makes it an easy read and a very lovable story. Sometimes, a story just doesn’t need more. In this case, less is more. Sometimes you just want a good romance story. And I can really recommend this one. Cambria, please go and write book two! What an awesome review!! Thank you so much for writing a review!